A word from the webmaster . . . Welcome to the shop. I started selling books with Amazon.com in 1999. Click here to see my first check! We have a good collection of steamboat books you may not find through an ordinary Amazon search. The rest of the subjects are my hobbies: writing, positive psychology, favorite musicians, world history, Eastern philosophy, rc toys, and pro-biotic products for home and garden. 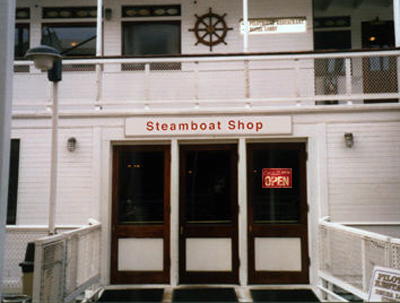 Steamboats History, photos, steamboat disasters, books about what it was like to live in the steamboat era. Writing Books on writing, favorite authors, including Mark Twain; books on art instruction! Positive Psychology Make Life Better - check into positive psychology and positive thinking. Music - Music by my favorite musicians, George Harrison, John Fahey, Tom Grant, Frank Zappa, and Captain Beefheart, plus musical selections by customers who have surfed in. History and Philosophy - World history and Eastern philosophy books our visitors picked! Radio Controlled Boats and Planes - just in case you did not want to get addicted to a new hobby, here come the r.c. toys! Find out how little it takes to get into this hobby. Friendly Microbe Products - get on the probiotic bandwagon, put the power of microbes to work in your home and garden.